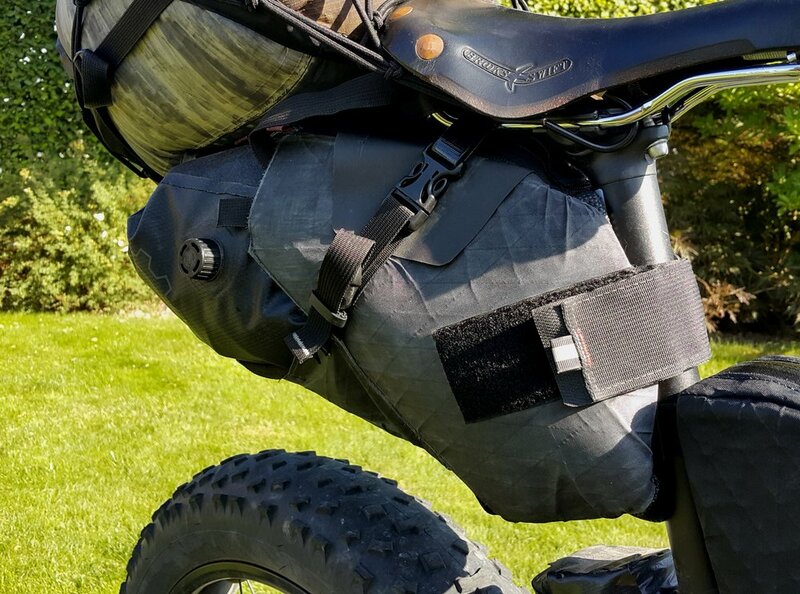 Below you can find a list of my bike bags along with my thoughts and experiences from using them every day. 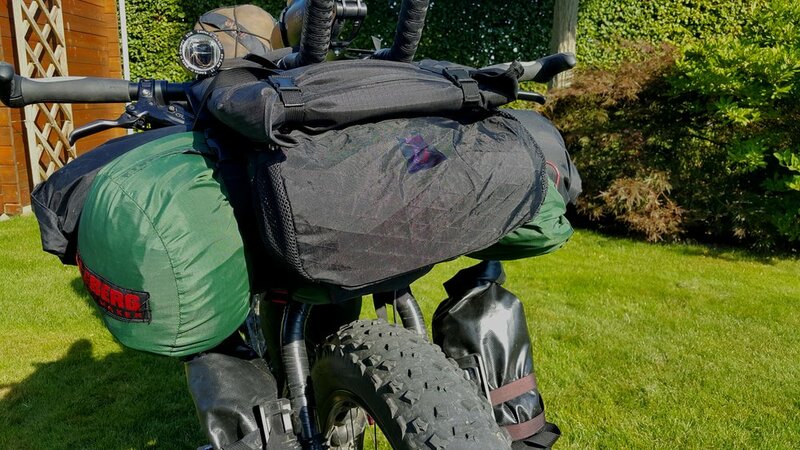 I live on my bike and these bags carry everything I own so I consider them crucial to my success traveling the rougher regions of the world. If they had serious flaws or fell apart quickly, they wouldn't last very long on this list. That being said, I am always on the hunt for new bags to try and improve my ride. If you have come across anything that you think raises the bar, let me know in the comments below. A full list of all my gear can be found by clicking here. See below my video that covers the bikepacking gear. This is the short duration version. A longer, much more detailed version can be found here. The Revelate Harness was an upgrade to my original Revelate Sweetroll which I took with me around Central America. 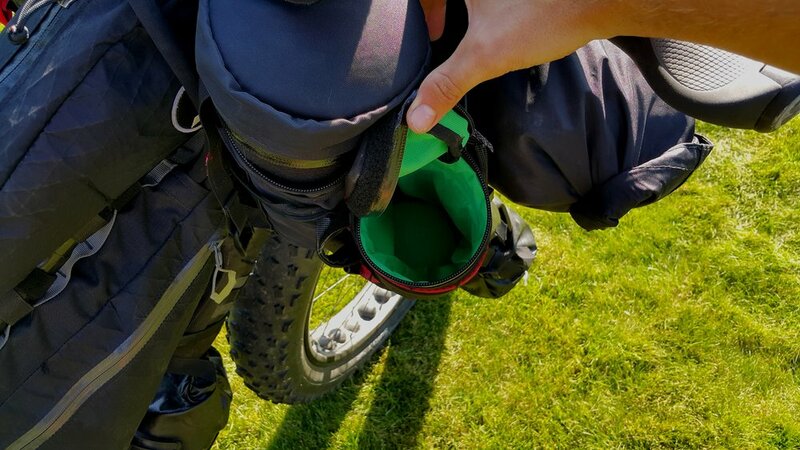 While the Sweetroll well and trully met my requirements, I was searching for larger options that could hold both a dry bag and my Hilleberg Nammatj tent. The harness was my answer to larger options and it has met all my expectations except for the stability element. 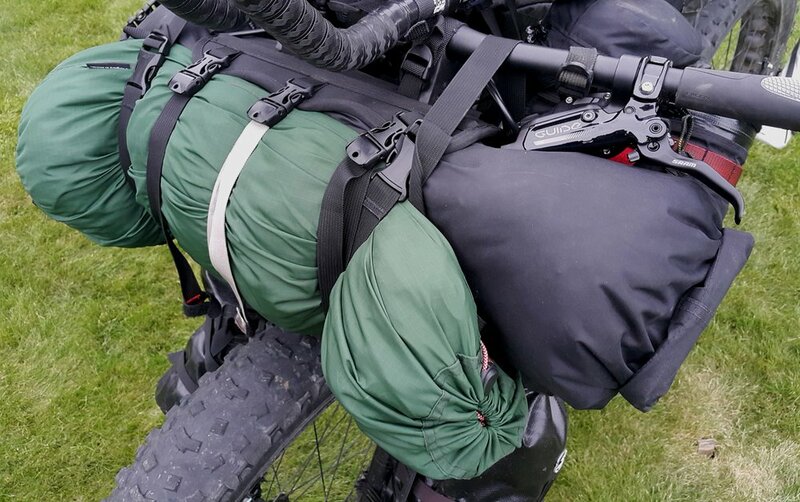 I find that with only the three straps it has, the dry bags shift as you ride over bumpy terrain. To fix this, I purchased two additional straps (with the male and female buckle) and strap down the ends of the dry bags to the handlebars. This has GREATLY increased stability and now it is no longer an issue. Would I recommend? For sure! I having used the similar Revelate Sweetroll previously, I knew the Saltyroll was a product I had tested before and given the tick of approval. Waterproof, durable, openings at each ending and a diameter that's not to wide or to thin - it's almost everything you can ask for in a bag. Almost. The only catch, which relates to it's partner product, the Revelate Harness, is that stability can be an issue with the Saltyroll sitting in the harness. While the Saltyroll does have daisy chains in the middle of the bag, it would be ideal if they could reach further along the bag length to support the additional straps required to stabilise the bag. 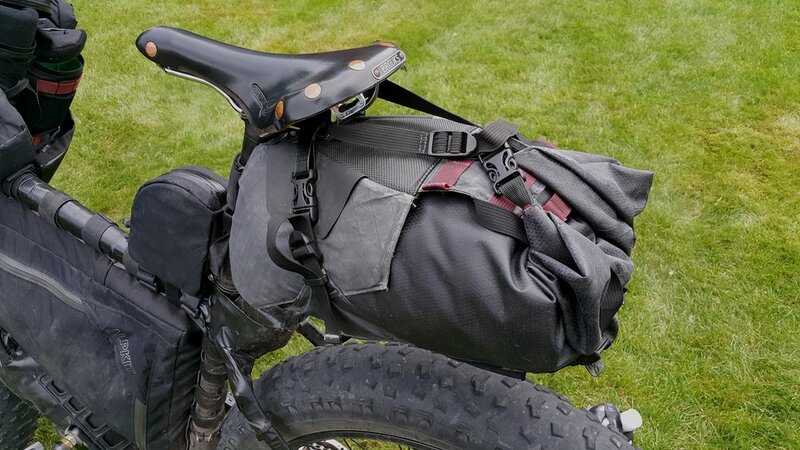 While large capacity bags like the Revelate Saltyroll and Revelate Terrapin Drybag are great to store the majority of your gear, they are very limited in their ability to be used on the go. The Revelate Pockets does a good job at landing somewhere in the middle - a reasonably large capacity in an easy to reach spot so you can access it as you ride. Food, glasses, cameras, small winter items, money/credit cards, I have used this bag for almost anything. Right now it holds a 1.4L / 48oz Nalgene bottle (stuffed to the nth degree with cold winter gear), toilet paper and my glasses. Like I said, almost anything. 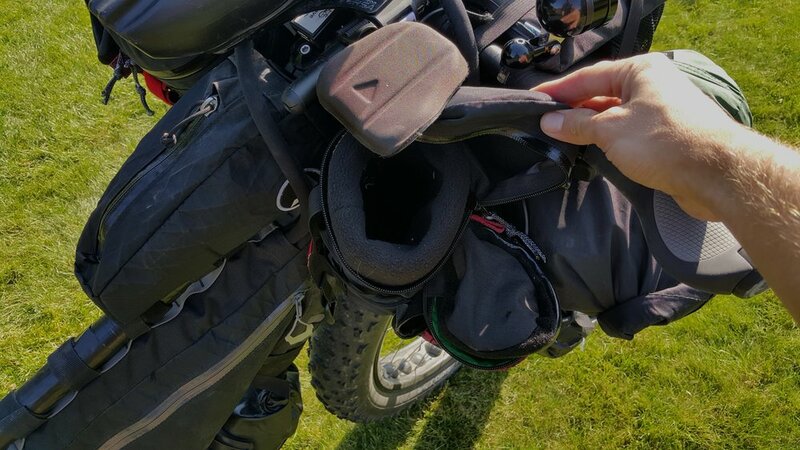 If you're carrying a big loads on your handlebars, I would recommend that you put a strap through the loop next to the zip and attach it to your handlebars. This ensures that even if the bag wants to slip down, the strap will stop it from doing so. Would I recommend? Without a doubt! 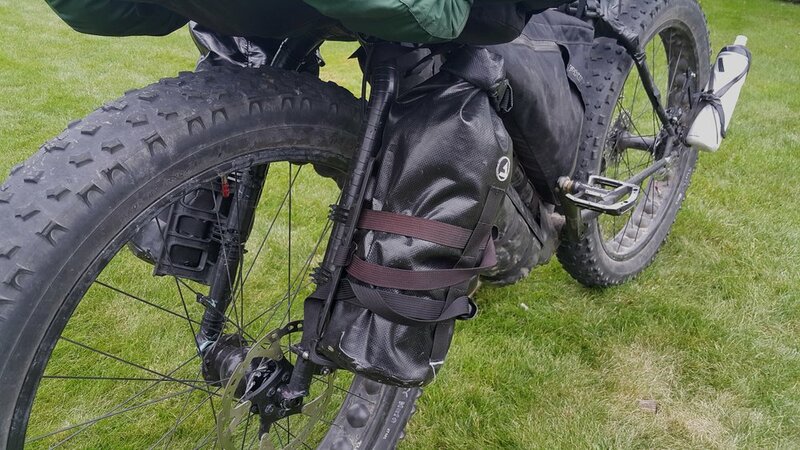 I previously used the Kada Pak Ratt 2 seat bag and decided to move to a holster system as I found the Pak Ratt would start to loose it's form as I rode resulting in it rubbing on the tyre. Fraying stitching after heavy use didn't help either. 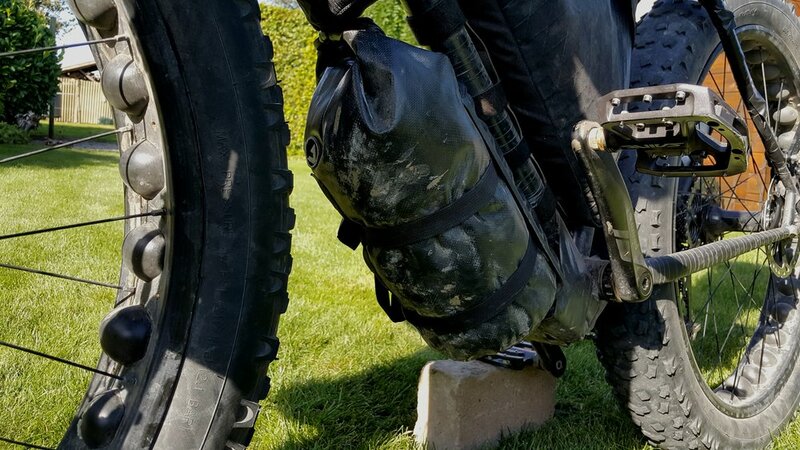 Swapping to the holster system with the Terrapin Holster was a good move and, like the Tarrapin Drybag, I'll be sticking with it for the foreseeable future. 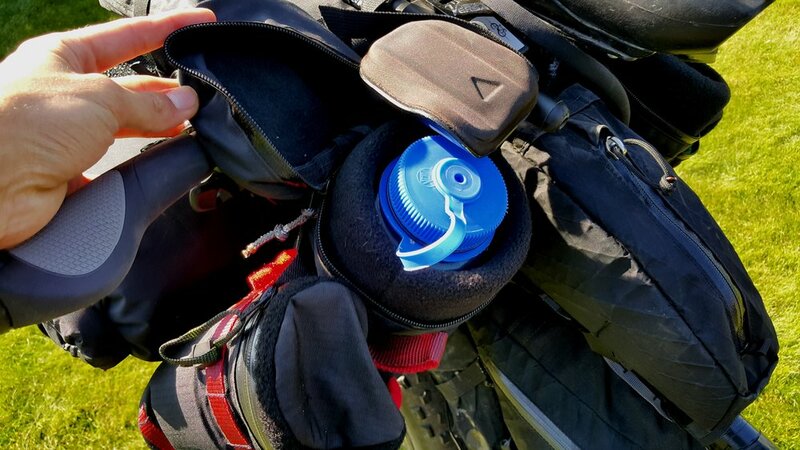 The rigidity of the holster also supports the Terrapin Drybag, stopping items inside the dry bag from moving. 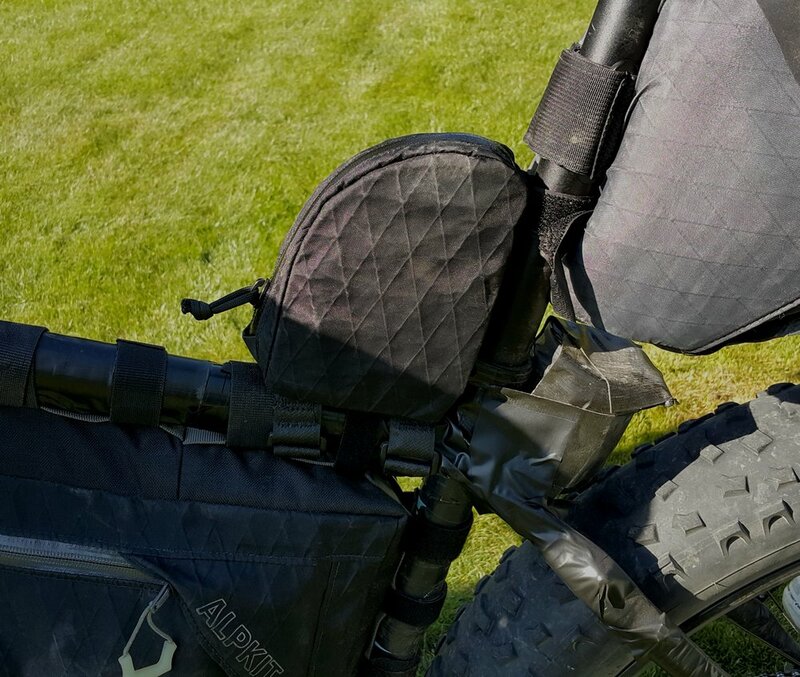 Strong straps also support the movement of the bag, vastly increasing the life of the holster as there is more stitching to distribute the stress of the bag moving. Would I recommend? You bet! 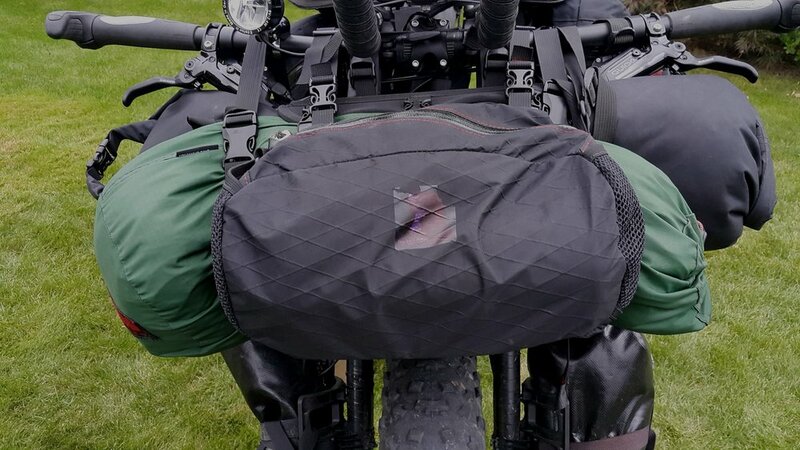 The Terrapin Drybag, being on the larger side of seat bags, has far outperformed my previous Pak Ratt seat bag and I'll be sticking with this bag for the foreseeable future. 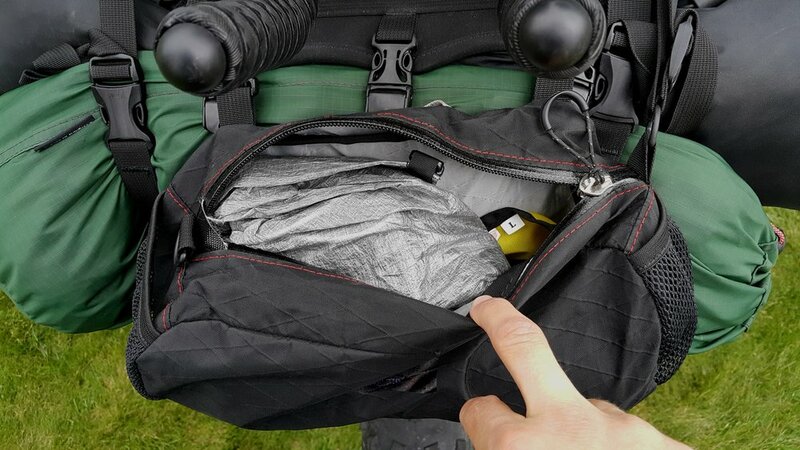 It's everything you would want in a seat bag (large capacity, solid material, strong straps) with the added benefits of a valve for compressing air out and it's waterproof. Oh and it conforms just right to the shape of the Revelate Holster to keep it steady in the holster. One thing i should mention is due to the amount of items I store in my Terrapin Drybag plus my large Feathered Friends Ibis EX 0 Sleeping Bag that sits on top, I use an additional strap around my dry bag to my seat. The strap doesn't hold much tension but helps share the strain from bumps. Is this additional strap required? I don't think so. I use it to give me peace of mind that the strain from the drybag bouncing around is being shared across the holster and supporting strap. That should mean the holster lasts longer. The Monida Insualted Bag I stumbled across looking for water bottle holder type bags and I'm very glad I did. While the bag is much larger than your standard water bottle bag (like the J.Paks Ruksak), I have found the advantages well suited to my needs and consider my pair a crucial part of my hydration system. Beyond the benefits of insulating your water on trails you happen to find yourself on in the depths of winter, the sheer capacity of these bags to hold 1.4L / 48 oz Nalgene bottles is impressive. My two insulated bags sit snugly under my aero bar pads next to my stem where I totally forget about them till I need water. That's exactly how it should feel. Would I recommend? Sure thing! 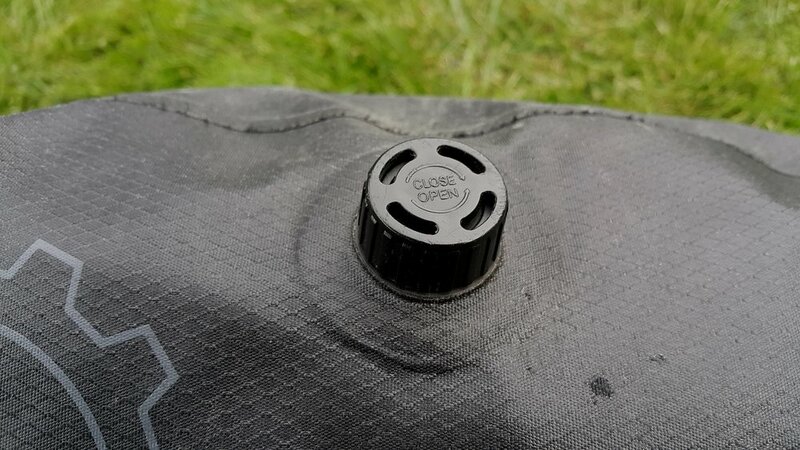 Looking for a top tube bag to rest up against my seat post, I found most were of a similar shape and size and ended up landing on the Alamito bag. The rigid material of the bag along with pulling the velcro tight make for a very secure bag - I never worry about it moving and interfering with my legs. Ultimately, I feel the bag (and other top tube bags at the seat post) could potentially be improved by having it longer, going up the seat tube. if I find myself in one place with a sowing machine and some free time I might just make my own. Bright green materials on the inside of the bag? Just kidding, I am a little short for words for this section. It's been a great bag. Would I recommend? Without hesitation! 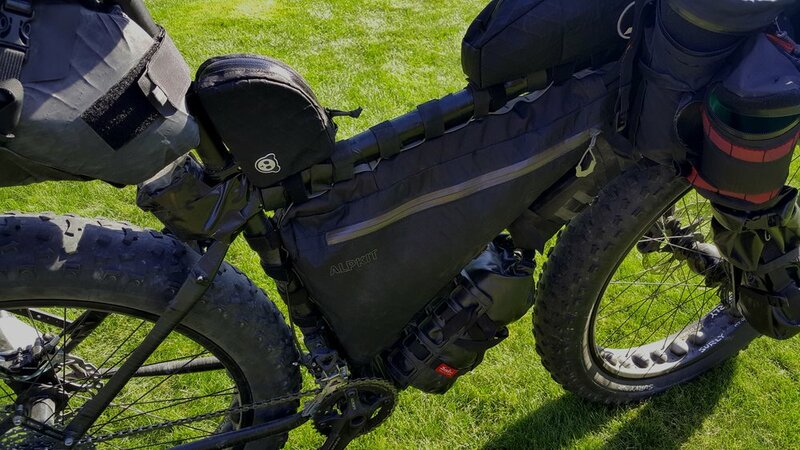 I was lucky enough to find myself in Denver, Colorado when I was searching for bike bags and came across J.Paks which is based not far from REI downtown. I was considering a number of top tube bags but landed on the Snakpak due to its large capacity and positive reviews of J.Paks bags. I ended picking up the bag from the J.Paks workshop where I got to meet Joe, the master mind behind it all. 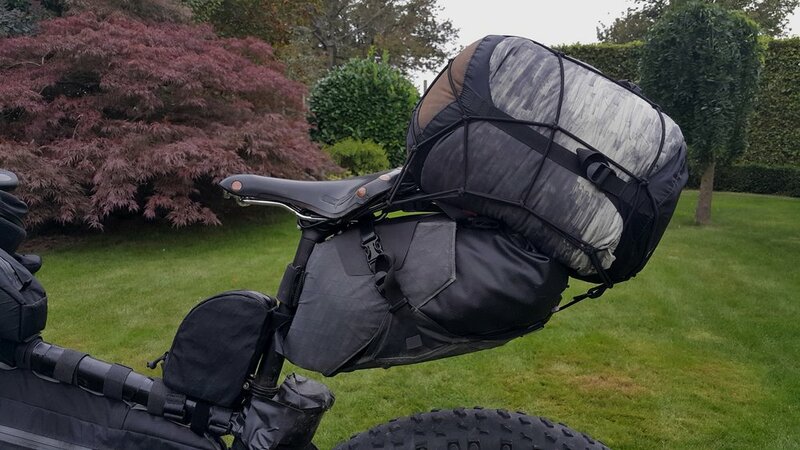 Joe made the extra effort to get my order through quick and he clearly has a passion for bikepacking and moving the industry forward in terms of bag design. My Snakpak gets heavily used every day and I'm glad I have it. You should have one too. I originally bought the Honaker to make use of the area between the top of my down tube and the tyre. To date it has lived in that spot and held my empty MSR Fuel Bottle in waiting for the depths of next winter when I'll need the fuel to melt snow for water. To be honest, I haven't touched the bag in months which you could say is a good thing as it doesn't become loose or get in the way. 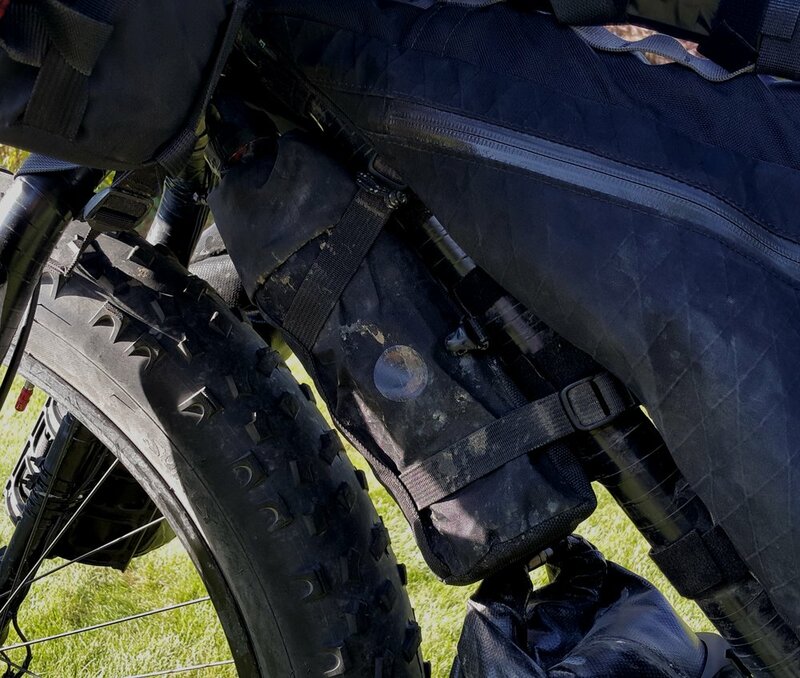 The one thing I would say is that without a daisy chain, you are limited to using the straps attached to the bag for find the right spot on the bike. I am constantly tinkering with where my bags sit and how they are secured so more options provided by a daisy chain are always a good move. I having swapped my dual suspension Santa Cruz Heckler for my current Surly Wednesday (you can read about the new bike setup here), I was eagerly looking forward to the big increase in capacity the new frame bag would provide. I wasn't dissapointed. It's huge! The Stingray has held up well to date with no issues. Strong material, bladder bag hole to feed tube through, pocket to hold quick access items, daisy chains all around to feed Velcro through. Good job Alpkit! The only one thing I would change is instead of ordering it with the surgeon zip, I would order it with the divider compartment. While the surgeon zip does give you a big opening, the items end up bulging at the bottom and at times the crank arm can clip the bag. 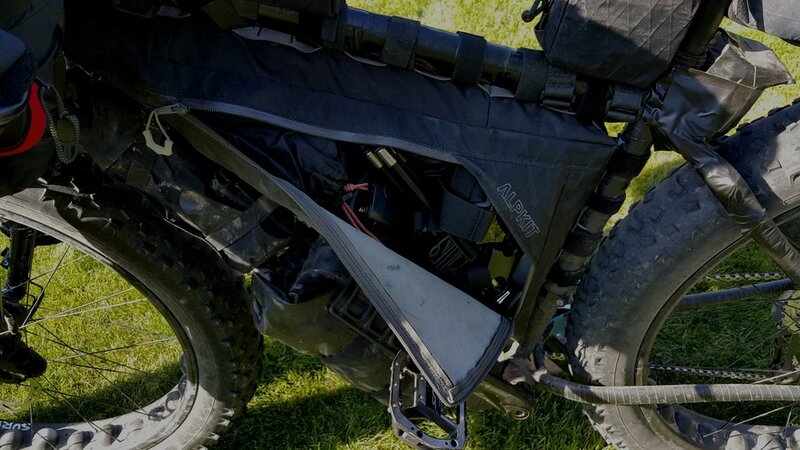 The divider compartment option would totally remove this issue and allow for the big heavy items like the tent poles, water bladder, bike chain etc. to sit in the top pocket with ease. Considering both the Salsa Anything Bag and the J.Paks Manything Pak as dry bag options to sit in my Salsa Anything Cages, I landed on the J.Paks bag due to the larger capacity. It also has a daisy chain on the front which is crucial to keeping the bag secured by feeding the straps through them. I use the bags for carrying food and have found it ideal to have my food that I need throughout the day in one bag and my more long term food in the other bag. The one alteration I would make to the bag would be applying a seam sealer to the bags stitching. I found that during heavy rain a little water would seep through; by seam sealing the stitching all the water problems went away. Straps provided with the bag are honestly a joke. Use your own straps rather than the ones provided. Note: I have only had the BOB's for a few weeks now. I feel an item is well tested after a few months so I'll update this review in due course. The BOB was my answer to searching for more easy access storage where I can put my daily used small items (e.g. iPods, GoPro and accessories, batteries, bananas, small food bags etc.). 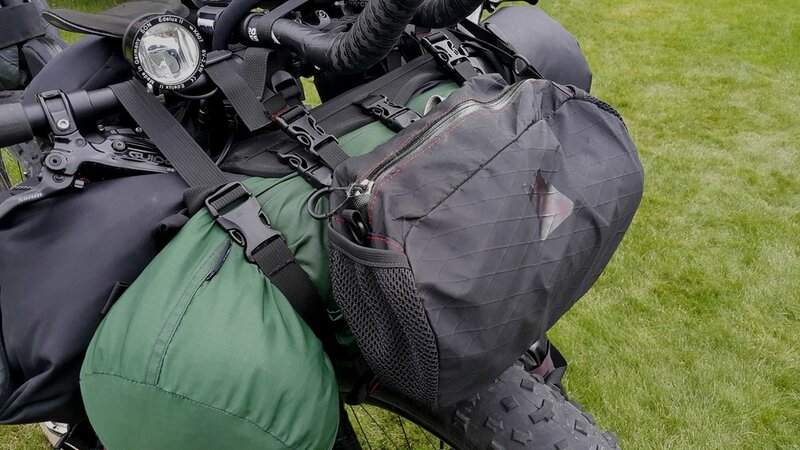 With it's limitless daisy chains and harder shell than most water bottle shaped bags, this bag has many options in terms of how it attaches to the bike. 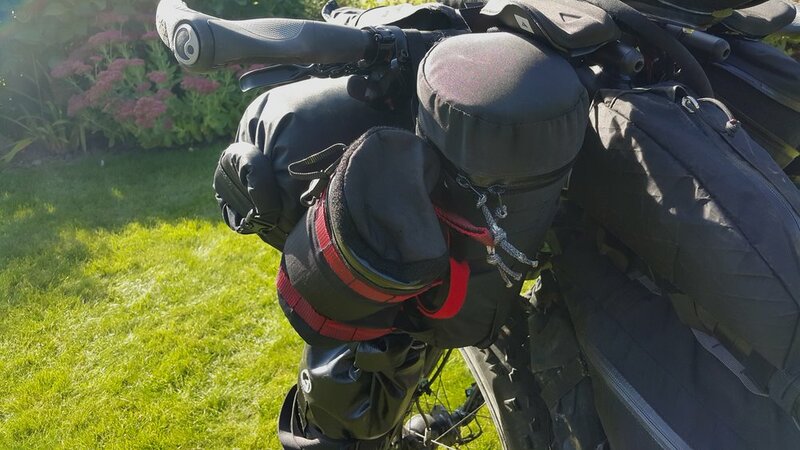 Right now I'm experimenting with it being attached to the Monida Insulated Bags, sitting nicely under my grips / shifters for easy access but without being intrusive. Gear Talk is an ongoing article series where all things gear related are discussed. Today's topics: Creating a DIY fat bike rear mud guard using plastic document folders and zip ties.